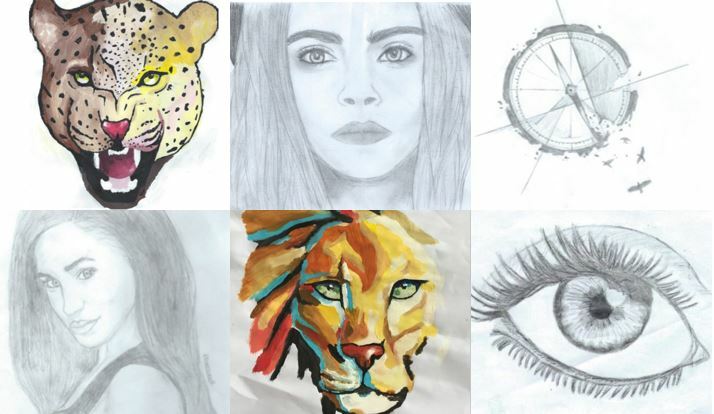 Welcome to my portfolio! 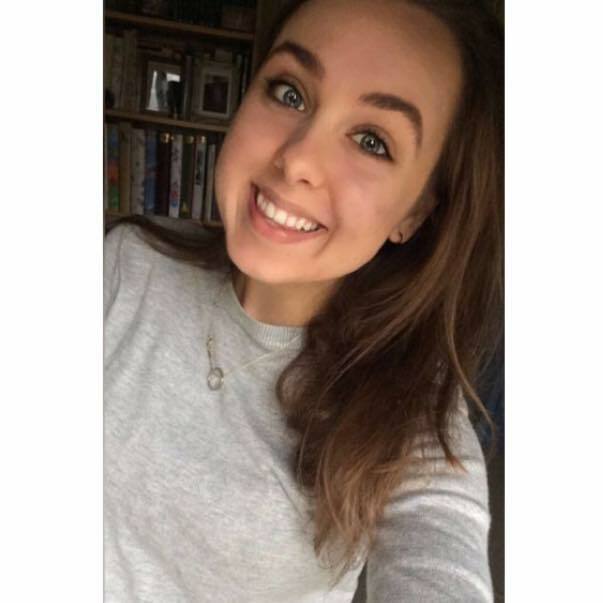 My name is Frederique Voskeuil and I am an 18 year old Creative Technology student at the University of Twente. I have chosen this study, because I have been creative since I was a little girl. 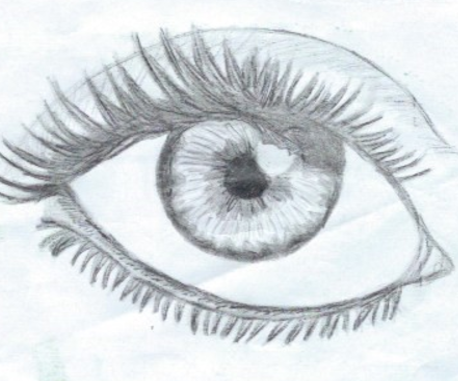 My mom used to tell me that I could almost draw earlier than I could walk. Besides, I like to think about how you can make environments smart with technology and make interaction between humans and media. I hope to challenge myself in the next few years in creating technology and making the society a little bit better! Here are some examples of my latest work. Click on the image to make them bigger ! This world is a jungle. The eye catches more than you think. 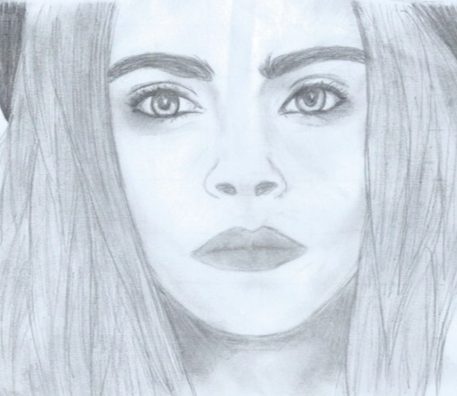 The woman in the drawing is the actress Cara Delevingne. 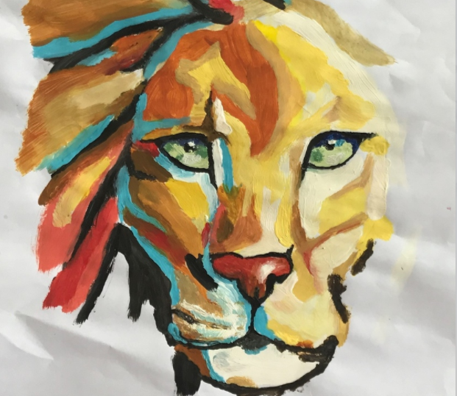 To create an other image of the lion than usual, I used for this painting unusual colours. It's already the end of the first module. Which means we had to turn in our end assignment, an interactive video. Our group chose for a story about Anna, a girl who is using Artificial Intelligence (AI). The AI is a copy of Anna's brain and it helps making her decisions. Due to this, Anna is able to do things more efficient than usual. Everything seems to work, but Anna is sometimes sceptical about the AI. She has to choose whether she wants to move on using AI or to live her life like a human. I really liked this project. We used to make videos in high school too, because this was part of the media and art subjects. The cooperation in the group went really well. I really like editing, so I did the editing part of the assignment. I'm very happy with the result! We watched all videos together with everyone from CreaTe last thursday. Everyone showed their projects on tv screens, so that you could walk by and play the games. You could really see that everyone put much effort in their projects! Our group made it to the final! But we unfortunately ended up in the 5th place. But it was great to see the other projects tho! This week we had to review the portfolio of one of our fellow students. 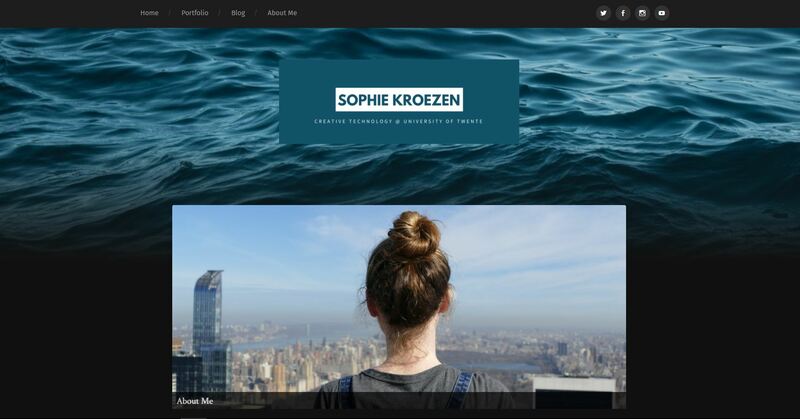 I reviewed the Showcase Portfolio of Sophie Kroezen. When I opened her site, the first thing that came to my mind was that everything was really clear. You could immediately see who's site you are visiting. Besides, the navigation bar on top easily directed you to the other parts of the site. What made me very relaxed was the layout of the site. The water as background images sets a very relaxing atmosphere. Besides, everything is in the same color code. 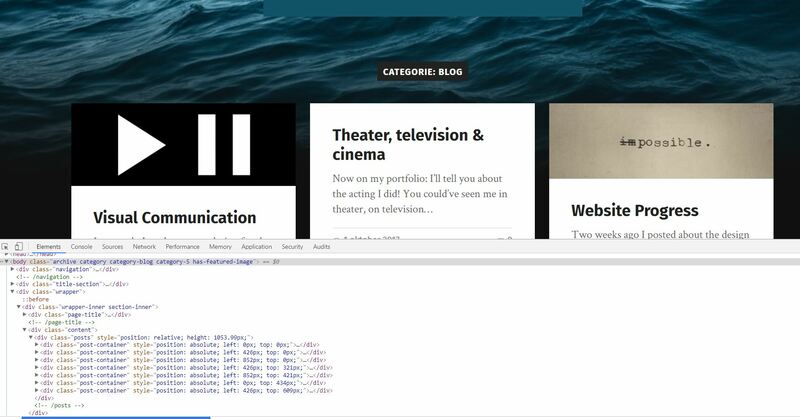 Nearby, the small boxes in the blog and portfolio part of the site make it very easy to switch from post to post. Reviewing Sophie's portfolio made me question some things of my portfolio too. Especially the blog page inspired me. The small blocks with blogpost made this site very clear and I would like to use this for my blog too. 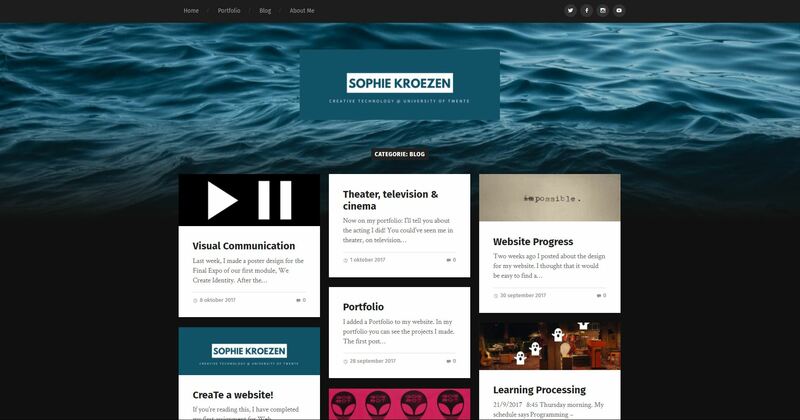 Sophie used a template from WordPress. It's called 'Garfunkel'. It is a simple design, but she made it personal with her own pictures and videos. When I looked at the technics of the portfolio, I found out that everything is very organised. It is perfectly readable for someone else. You can see her portfolio for yourself too! We had to make a creature in programming this week. I have improved bambi. 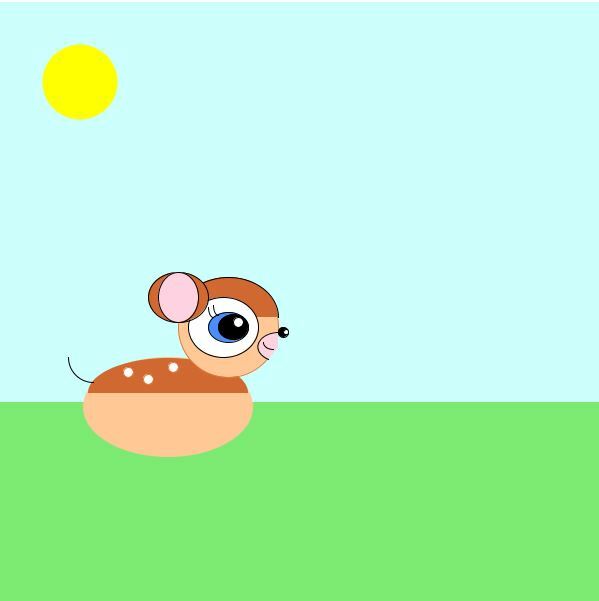 Bambi can move with the arrow keys. On top of that, I have added an array (a lot) of birds. I'm very happy with the result! Furthermore, I like Visual Communication. I like to learn to principals of design. We have to make a poster for next week. I already have a lot of ideas! I applied these design techniques on my website with adding my own pictures. I added a 'resume'-button in the first container and some pictures showing my drawing skills in the second container. To further expand upon my portfolio, I have added some new paintings that I made in high school. You can see it here! It is already the fourth week of my life as student at the University of Twente and I can already program a bit! We use Processing for programming. You can see my bambi on the left! If you click in Processing, bambi will change it's color. I think it's very cool that we can already program a bit! 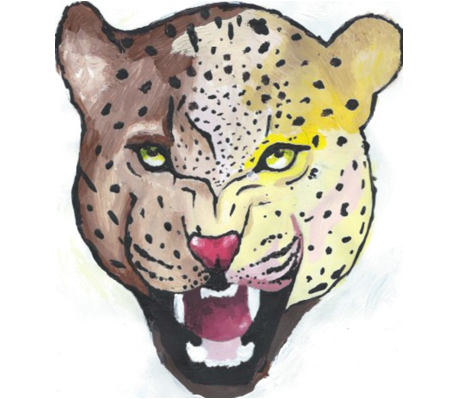 I started my portfolio with my selfmade paintings and videos. Most of them where made on at the Art and Media program at my high school. Feel welcome to take a look here! The installation I liked the most was the Bus Lightyear. I loved the idea of starting at the Oude Markt in the centre of Enschede from which you travelled to space. The simulation felt real, because you entered a physical spaceship they built from wood. Inside you experienced the space simulation which felt quite real. The simulation lasted four minutes, but it couldn’t last long enough for me. 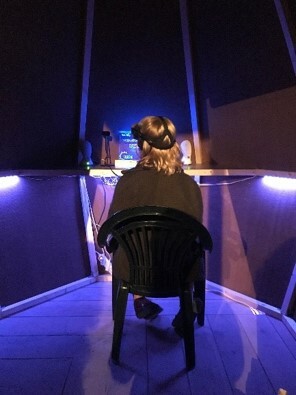 The virtual reality technique isn’t broadly applied today. I have experienced virtual reality just once before. The special thing about this project is that the creators of the Bus Lightyear told us everything was self-made. 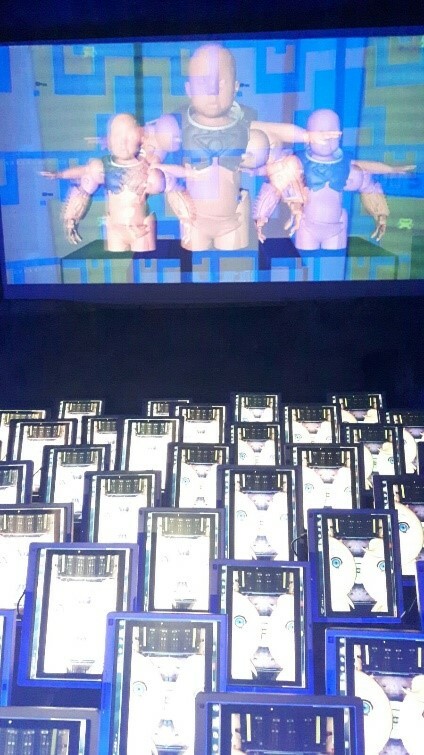 They told me that the models were made with the program Maya. I hope to create a virtual reality world myself in the future. After travelling to space in the Bus Lightyear, I arrived at an artwork from Heidi Hörsturz. I heard the noise from far. It irritated me because it had just one sound that was repeating constantly. Furthermore, the flashing pictures annoyed me. It looked like the computers were crashing. This artwork made me feel really stressed. The noise and flashing images made me want to leave the room a soon as possible. Besides, I didn’t get the meaning of the artwork. I looked online for the artist when I got home. The artwork represents the present-day which people are trying to make better with a colourful online world. It is a self-reflection on the society. I can understand the artwork better with this knowledge, but I think it must be clear what the meaning is of art when you see it. This was the installation that irritated me the most. I didn’t like the experience. If this is art, it is art I didn’t like. Welcome to my blog! Last week we started making a blog, to present our own portfolio. 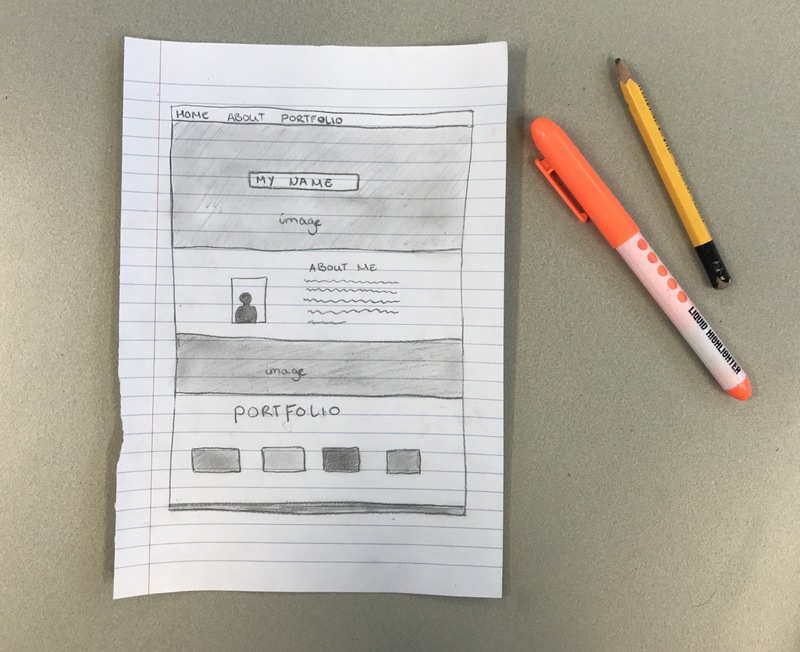 Before we began to design our website with HTML, we made some sketches on paper. You can see the first sketch of my site on the left! I started with a template and made it personal with my own pictures and other things. I didn't want to use WordPress, because feel like I'm not learning enough of HTML that way. Though, I would still like to add a few things to my website, like the assignments of the modules. Furthermore, I would like to add music, because music helps me through everything.